If you have a Netgear, Linksys, Cisco, D-Link, or any other type of router and you’re trying to figure out how to log into router in order to configure settings, there are a couple of steps you can take. If you have never logged into the router and no one has ever set up a password, then your router will have the default username and password. You can find this information in different places depending on your router brand and setup. Let’s start with the simplest solutions. Firstly, if there is already a password on your router and you need to reset the wireless router back to the default settings, you can press the “Reset” button that is located on the back of the router. It’s usually a very small hole and you’ll have to use a pin or paper clip to push the button inside for about 30 seconds. This will now reset your router to the default settings! I normally keep the paperwork for my routers because it always has the default login info for the router in the pamphlet. Actually, now I just take a picture of the page that has the login info using my smartphone and save the image to a folder where I store useful bits of information I need later on. However, most people don’t really keep the box or the paperwork around, which is understandable. 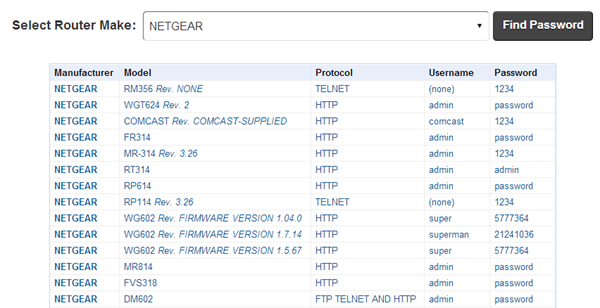 It sounds silly, but a lot of routers have the default login info printed right on the router itself. It actually makes sense because if someone else wanted to figure out the default login info, they can do it very easily just by know your router model number. That’s why it’s so important to change the default password on your wireless router so no one else can hack into it. If you have a cable modem/router from your ISP, then it’s almost guaranteed to have the login password printed on the router itself. ISPs usually add the wireless network SSID and password on the router also so that they don’t have to deal with customers calling them and asking them why they can’t connect. I’ve seen several Verizon modems/routers and they include the password for logging into the router also. If you don’t have the documentation on you or your router doesn’t have the info printed on the device, then you can check out a couple of websites that basically are databases of router passwords. 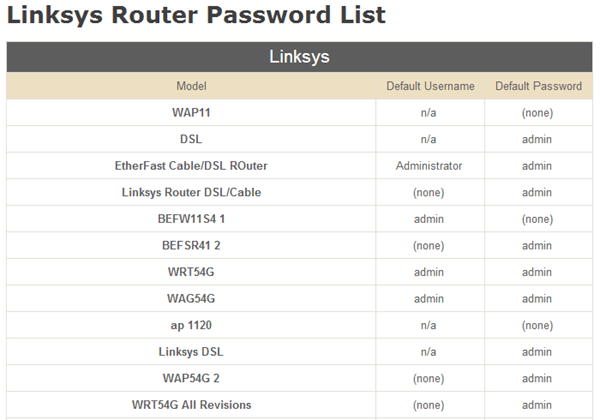 RouterPasswords.com has an exhaustive list of all the major routers, plus a lot more brands. It had the right username and password for my Netgear router, so it should work for you. The only problem I’ve seen with this site lately is that it hasn’t been updated since 2012. It still will work for most people, but if you have a newer router, you may find your model missing. PortForward.com is another site with a ton of router brands and models. I have found that PortFoward actually has quite a few more models for a lot of brands than RouterPasswords, so maybe they are keeping their database more up-to-date. Make sure you scroll down to see the list of brands and list of models. That should hopefully get you back into your router so that you can configure it the way you want. If you can’t figure out the IP address for your router, read my previous post on how to find a router IP address. Once you have the IP address, simply type that into your browser window and it should bring you to the login screen for your router. Enjoy!